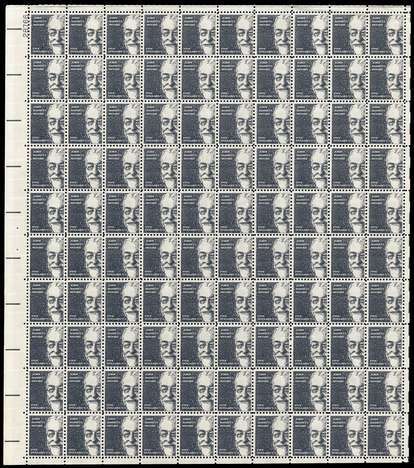 Scott #1295a [1966 $5 John Bassett Moore; 1973 TAGGED printing] NH VF/XF/Superb full sheet. Upper left corner, plate #28766. The left two columns, including the plate block are XF-Superb -- unusual for a stamp on which the centering usually varies greatly. There is a slight (typical for this issue) offset impression on the gum on the lower right two stamps. The upper right has some minor bending in the selvedge which I think will flatten out. Otherwise pristine. This sheet is scarce; most of them were broken up and used for postage a long time ago. There were two plate numbers for this issue; both of them exist both non-tagged (#1295, a little scarcer as singles) and tagged (#1295a). It is my observation that though #1295a (tagged) singles are more common, the #1295a sheet is scarcer -- anybody who was buying such costly sheets at the time (this was a lot of money back then) had already purchased #1295 -- they either did not know about the #1295a tagged version or did not care to spend so much money again. This is a real sleeper! The searching I have done finds a couple examples of #1295 (untagged) sheets offered, but I have been unable to find any #1295a (tagged) sheets offered. My most recent Brookman does not price sheets of either, but apparently a later version lists #1295 (untagged) at $1880 (much too high). Regardless, this #1295a (tagged) version is very scarce and is missing the vast majority of sheet collections.